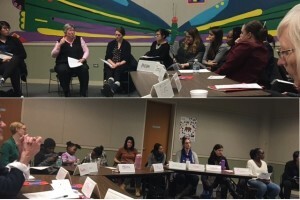 On Wednesday, January 24, we at the Chicago Chapter of the National Organization of Women (CNOW) collaborated with YWCA’s Racial Justice Director, Eileen Hogan Heineken, to embark on a journey toward a greater understanding of the way our cultures shape who we are, our institutions, how we see others, and ways to become inclusive. For an hour and a half, 30 CNOW training participants took a deep dive into the way our implicit biases affect our viewpoints. Eileen facilitated an excellent discussion that began with participants partnering with each other to talk about their cultural upbringing. This exercise elucidated a common theme that resonated across cultures which include how many of us came to a greater understanding of our cultural heritage only when we left our homogeneous childhood environments and felt the difference between how we perceived ourselves and how we are treated by society at large. We discussed how our origins shape the way we see the world as adults and examined the idea of a monolithic view of the “norm”. I particularly enjoyed our discussion of the formation of implicit biases and how we can work to overcome them to be inclusive of others who are different from ourselves. Many of us recounted experiences they had where they were treated differently or discriminated against based upon the idea of what someone of their skin color, race, or gender is expected to look and act like. After venting our collective frustration at the way racial and gender stereotypes are embedded in American culture and keep those who aren’t white, male, or otherwise what cultural messaging often describes as “the norm,” several participants admitted that they struggle to this day with internal negative reactions to those from other groups based on these biases. Eileen encouraged us to face these struggles head on, and consciously work toward eradicating our internal biases and to advocate for institutional policies and practices that promote inclusion as tools for greater systematic change. Furthermore, we have a responsibility not only to confront bias in ourselves, but to call out others who act based on bias. If someone makes a bad joke based on a racial stereotype – we tell them they are not funny. If someone acts in a discriminatory fashion, we stand up for the person they are discriminating against. Overall, this session was a terrific way to brainstorm concrete steps we can take, as an organization and as individual activists, to make sure that we challenge injustice when we see it and to be inclusive of all when working toward our goals here at CNOW and across Chicago.